The IndexEditor is invoked as part of a commit (Session.save()), or as part of the asynchronous “diff” process. For both cases, at some stage “diff” is performed between the before and the after state, and passed to IndexUpdate, which is responsible for invoking the IndexEditor based on the discovered index definitions. sync - The default value. It indicates that index is meant to be updated as part of each commit. nrt - Indicates that index is a near real time index. Any other value which ends in async. reindex - If set to true, reindexing is performed for that index. After reindexing is done, the property value is set to false. See reindexing for more details. Based on the above two properties, the IndexUpdate creates an IndexEditor instances as it traverses the “diff”, and registers them with itself, passing on the callbacks for changes. Indexing logic supports placing oak:index nodes at any path. Depending on the location, such indexes only index content which are present under those paths. So, for example if ‘oak:index’ is present at ‘/content/oak:index’, then indexes defined under that node only index repository data present under ‘/content’. Depending on the type of the index, one can create these index definitions under the root path (‘/’), or non-root paths. Currently only lucene indexes support creating index definitions at non-root paths. property indexes can only be created under the root path, that is, under ‘/’. Under synchronous indexing, the index content gets updates as part of the commit itself. Changes to both the main content, as well as the index content, are done atomically in a single commit. This mode is currently supported by property and reference indexes. Asynchronous indexing (also called async indexing) is performed using periodic scheduled jobs. As part of the setup, Oak schedules certain periodic jobs which perform diff of the repository content, and update the index content based on that. Look for the last indexed state via stored checkpoint data. If such a checkpoint exists, then read the NodeState for that checkpoint. If no such state exists, or no such checkpoint is present, then it treats it as initial indexing, in which case the base state is empty. This state is considered the before state. Create a checkpoint for current state and refer to this as after state. Create an IndexUpdate instance bound to the current indexing lane, and trigger a diff between the before and the after state. IndexUpdate will then pick up index definitions that are bound to the current indexing lane, will create IndexEditor instances for them, and pass them the diff callbacks. The diff traverses in a depth-first manner, and at the end of diff, the IndexEditor will do final changes for the current indexing run. Depending on the index implementation, the index data can be either stored in the NodeStore itself (for indexes of type lucene, property, and so on), or in any remote store (for type solr). AsyncIndexUpdate will then update the last indexed checkpoint to the current checkpoint and do a commit. Such async indexes are eventually consistent with the repository state, and lag behind the latest repository state by some time. However, the index content is eventually consistent, and never ends up in wrong state with respect to repository state. A checkpoint is a mechanism, whereby a client of the NodeStore can request Oak to ensure that the repository state (snapshot) at that time can be preserved, and not removed by the revision garbage collection process. Later, that state can be retrieved from the NodeStore by passing the checkpoint. You can think of a checkpoint as a tag in a git repository, or as a named revision. Async indexing makes use of checkpoint support to access older repository state. Here, userIndex is bound to the “async” indexing lane, while assetIndex is bound to the “fulltext-async” lane. Oak setup configures two AsyncIndexUpdate jobs: one for “async”, and one for “fulltext-async”. When the job for “async” is run, it only processes index definition where the async value is async, while when the job for “fulltext-async” is run, it only pick up index definitions where the async value is fulltext-async. These jobs can be scheduled to run at different intervals, and also on different cluster nodes. Each job keeps its own bookkeeping of checkpoint state, and can be paused and resumed separately. Prior to Oak 1.4, there was only one indexing lane: async. In Oak 1.4, support was added to create two lanes: async and fulltext-async. With 1.6, it is possible to create multiple lanes. In a clustered setup, one needs to ensure in the host application that the async indexing jobs for all lanes are run as singleton in the cluster. If AsyncIndexUpdate for the same lane is executed concurrently on different cluster nodes, it leads to race conditions, where an old checkpoint gets lost, leading to reindexing. See also clustering for more details on how the host application should schedule such indexing jobs. AsyncIndexUpdate has an in-built “lease” logic to ensure that even if the jobs gets scheduled to run on different cluster nodes, only one of them runs. This is done by keeping a lease property, which gets periodically updated as indexing progresses. An AsyncIndexUpdate run skips indexing if the current lease has not expired. If the last update of the lease was done too long ago (default: more than 15 minutes), it is assumed that cluster node that is supposed to index is not available, and some other node will take over. The lease logic can delay the start of indexing if the system is not stopped cleanly. As of Oak 1.6, this does not affect non-clustered setups like those based on SegmentNodeStore, but only affects DocumentNodeStore based setups. Async indexing jobs are by default configured to run at an interval of 5 seconds. Depending on the system load and diff size of content to be indexed, the indexing may start lagging by a longer time interval. Due to this, the indexing results can lag behind the repository state, and may become stale, that means new content added will only show up in query results after a longer time. The IndexStats MBean keeps a time series and metrics stats for the indexing frequency. This can be used to track the indexing state. NRT Indexing introduced in Oak 1.6 helps in such situations, and can keep the results more up to date. Async indexers can be configure via the OSGi config for org.apache.jackrabbit.oak.plugins.index.AsyncIndexerService. Different lanes can be configured by adding more rows of Async Indexer Configs. Prior to 1.6, the indexers were created programatically while constructing Oak. FailingIndexStats - Stats around indexes which are failing and marked as corrupt. LastIndexedTime - Time up to which the repository state has been indexed. Status - running, done, failing etc. Failing - boolean flag indicating that indexing has been failing due to some issue. This can be monitored for detecting if indexer is healthy or not. ExecutionCount - Time series data around the number of runs for various time intervals. pause - Pauses the indexer. abortAndPause - Aborts any running indexing cycle and pauses the indexer. Invoke ‘resume’ once you are ready to resume indexing again. The AsyncIndexerService marks any index which fails to update for 30 minutes (configurable) as corrupt, and ignore such indexes from further indexing. This feature can be disabled by setting failingIndexTimeoutSeconds to 0 in the AsyncIndexService config. See also OAK-4939 for more details. T1, T3 and T5 - Time instances at which checkpoints are created. T2 and T4 - Time instance when async indexer runs completed and indexes were updated. v2 - Index version v2, which has repository state indexed up to T1. v3 - Index version v2, which has repository state indexed up to T3. NRT1 - Local index, which has repository state indexed between T2 and T4. NRT2 - Local index, which has repository state indexed between T4 and T6. As the repository state changes with time, the Async indexer will run and index the changes between the last known checkpoint and current state when that run started. So when async run 1 completed, the persisted index has the repository state indexed up to T3. Now without NRT index support, if any query is performed between T2 and T4, it can only see index results for the repository state at T1, as that is the state where the persisted indexes have data for. Any change after that cannot be seen until the next async indexing cycle is complete (at T4). Persisted Index - This is the index which is updated via the async indexer run. This flow remains the same, it will be periodically updated by the indexer run. Local Index - In addition to persisted index, each cluster node will also maintain a local index. This index only keeps data between two async indexer runs. Post each run, the previous index is discarded, and a new index is built (actually, the previous index is retained for one cycle). Any query making use of such an index will automatically make use of both the persisted and the local indexes. With this, new content added in the repository after the last async index run will also show up quickly. 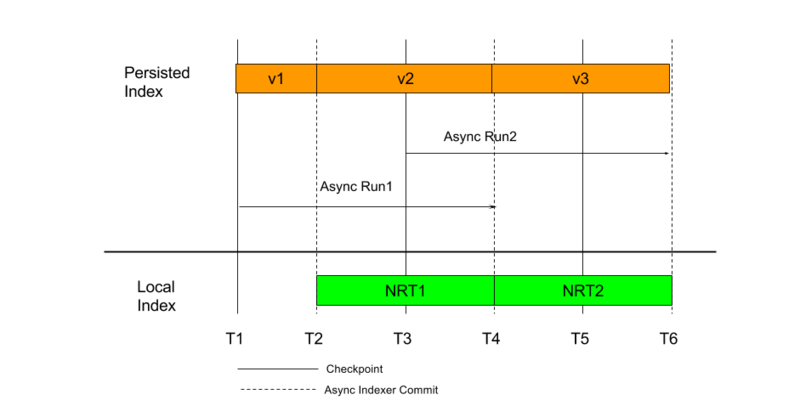 NRT Indexing Mode - nrt or sync. In this mode, the local index is updated asynchronously on that cluster nodes post each commit, and the index reader is refreshed each second. So, any change done should show up on that cluster node within 1 to 2 seconds. In this mode, the local index is updated synchronously on that cluster nodes post each commit, and the index reader is refreshed immediately. This mode indexes more slowly compared to the “nrt” mode. For a single node setup (for example with the SegmentNodeStore), this mode effectively makes async lucene index perform same as synchronous property indexes. However, the ‘nrt’ mode performs better, so using that is preferable. In cluster setup, each cluster node maintains its own local index for changes happening in that cluster node. In addition to that, it also indexes changes from other cluster nodes by relying on Oak observation for external changes. This depends on how frequently external changes are delivered. Due to this, even with NRT indexing changes from other cluster nodes will take some more time to be reflected in query results compared to local changes. enableHybridIndexing - Boolean property, defaults to true. Can be set to false to disable the NRT indexing feature completely. hybridQueueSize - The size of the in-memory queue used to hold Lucene documents for indexing in the nrt mode. The default size is 10000. Reindexing rarely solves problems. Specially, it does not typically make queries return the expected result. For such cases, it is not recommended to reindex, also because reindex can be very slow (sometimes multiple days), and use a lot of temporary disk space. Note that removing checkpoints, and removing the hidden :async node will cause a full reindex, so doing this is not recommended either. If queries don’t return the right data, then possibly the index is not yet up-to-date, or the query is incorrect, or included/excluded path settings are wrong (for Lucene indexes). Instead of reindexing, it is suggested to first check the log file, modify the query so it uses a different index or traversal, and run the query again. A: In case a property index configuration was changed, such that the index is used for queries, but doesn’t contain some of the nodes. Nodes that existed before the index configuration was changed, are not indexed. A workaround is to change (‘touch’) the affected nodes. B: Prior to Oak 1.6, in case a Lucene index definition was changed (same as A). In Oak 1.6 and newer, queries will use the old index definition until the index is reindexed. C: Prior to Oak 1.2.15 / 1.4.2, in case the query engine picks a very slow index for some queries because the counter index (/oak:index/counter) got out of sync after adding and removing lots of nodes many times. For this case, it is recommended to verify the contents of the counter index first, and upgrade Oak before reindexing. To view the content, use the NodeCounter JMX bean and run getEstimatedChildNodeCounts with p1 = / and p2 = 2. If there is a problem, then the estimated node count of root node typically is very low, more than 10 times lower than the sum of its children. Only the counter index needs to be reindexed in this case. The workaround (to avoid reindexing) is to manually tweak index configurations using manually set entryCount of the index that should be used to a low value (as high as possible so that the index is still needed), for example to 100 or 1000. D: In case a binary of a Lucene index (a Lucene index file) is missing, for example because the binary is not available in the datastore. This can happen in case the datastore is misconfigured such that garbage collection removed a binary that is still required. In such cases, other binaries might be missing as well; it is best to traverse all nodes of the repository to ensure this is not the case. E: In case a binary of a Lucene index (a Lucene index file) is corrupt. If the index is corrupt, an AsyncIndexUpdate run will fail with an exception saying a Lucene index file is corrupt. In such a case, first verify that the following procedure doesn’t resolve the issue: stop Oak, remove the local copy of the Lucene index (directory index), and restart. If the index is still corrupt after this, then reindexing is needed. In such cases, please file an Oak issue. F: Prior to Oak 1.2.24 / 1.4.13 / 1.6.1, when using the document store (MongoDB or RDBMK) in combination with a large transaction (a commit that changed or added many thousand nodes), and if one of the parent nodes had more than 100 child nodes, then indexes (all types) did not see those changes in some cases. G: Prior to Oak 1.4.7, when repository sidegrade was used to do partial migrations, that is migrating data without migrating related indexes. In this case, the property indexes need to be either fully rebuilt, or (as an alternative) copy or migrate the content again using a newer version of Oak. See also OAK-4684. H: If a binary is missing after reindexing. This can happen in the following case: When reindexing or creating a new index takes multiple days, and during that time, after one day or later, datastore garbage collection was run concurrently. Some binaries created during by reindexing can get missing because datastore garbage collection removes unreferenced binaries older than one day. Indexing or reindexing using oak-run is not affected by this. I: Prior to Oak 1.0.27 / 1.2.11, if an index file gets larger than 2 GB, then possibly the index can not be opened (exception “Invalid seek request”), and subsequently the index might get corrupt. See also OAK-3911. Once changes are saved, the index is reindexed. For asynchronous indexes, reindex starts with the next async indexing cycle. For synchronous indexes, the reindexing is done as part of save (or commit) itself. For a (synchronous) property index, as an alternative you can use the PropertyIndexAsyncReindexMBean; see the reindeinxing property indexes section for more details on that. Once reindexing is complete, the reindex flag is set to false automatically. If the index being reindexed has full text extraction configured then reindexing can take long time as most of the time is spent in text extraction. For such cases its recommended to use text pre-extraction support. The text pre-extraction can be done before starting the actual reindexing. This would then ensure that during reindexing time is not spent in performing text extraction and hence the actual time taken for reindexing such an index gets reduced considerably. Building an index can be slow. It can be aborted (stopped before it is finished), for example if you detect there is an error in the index definition. Reindexing and building a new index can be aborted when using asynchronous indexes. For synchronous indexes, it can be stopped if it was started using the PropertyIndexAsyncReindexMBean. To do this, use the respective IndexStats JMX bean (for example, async, fulltext-async, or async-reindex), and call the operation abortAndPause(). Then, either set the reindex flag to false (for an existing index), remove the index definition (for a new index), or change the index type to disabled. Store the change. Finally, call the operation resume() so that regular indexing operations can continue.